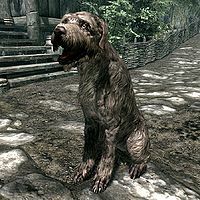 Stump is a dog that belongs to Frodnar and lives in Riverwood. He follows Frodnar around during the day and spends the night outside. Attacking or killing Stump will result in a bounty in Whiterun Hold and will cause the residents of Riverwood to turn hostile. If Frodnar is orphaned and you adopt him, Stump will continue to follow Frodnar, causing him to travel from Riverwood to your house and back every day. This bug is fixed by version 1.0 of the Unofficial Hearthfire Patch. This page was last modified on 30 April 2013, at 23:42.